SETH’S PICK :: BLACK BEETLE #1: It’s true that our Charlotte MiniCon will take place on Sunday, January 20, but first we’ll be spending Tuesday and Wednesday working on new comic arrivals. Black Beetle is my pick of the week for a few different reasons. One, it’s a mini series written and illustrated by Eisner award winning Franceseco Francavilla. He’s done cover work for just about every company, and I bet there are at least 3 or 4 of his covers still on our stands. Two, it’s a simple, direct pulp/adventure comic done out of love for the genre. You still get Francavilla’s art, but you also get a new world full of mobsters, mysteries and monsters. 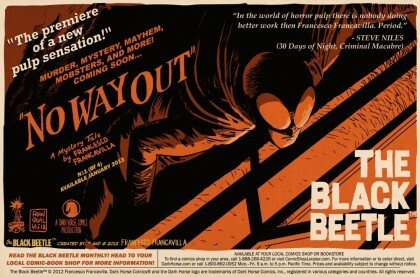 How Francavilla found time to produce this series with his already full plate is baffling, but I’m happy that he did. Finally, it’s also a good palate-cleansing comic if you’ve been reading lots of mainstream super hero or indie comics lately. Black Beetle #0 is one I’ve returned to on several occasions since it debuted a few weeks ago, and I’m sure you will too.